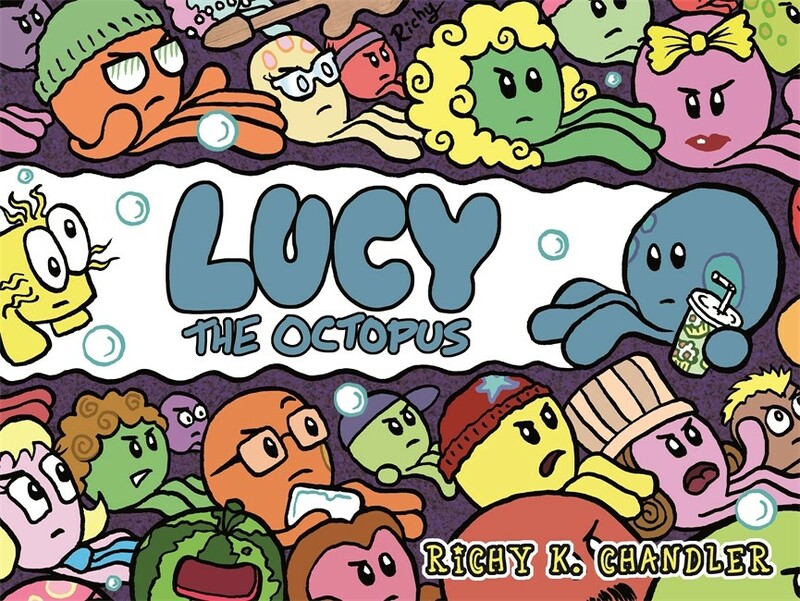 Collecting the long-running webcomic (previously presented in a number of self-published print issues over the years), Jessica Kingsley Publishing’s Lucy the Octopus brings together all of the adventures of Richy K. Chandler’s much-loved undersea heroine in a hard copy format for the first time. I’ve covered Lucy’s world a number of times over the years at Broken Frontier (including an interview with Chandler here) saying of it “Taking that great comic strip tradition of the loveable loser and then amplifying it to the point of distortion Lucy the Octopus is, in turns, blackly humorous and actually really rather poignant.” A pull quote that appears on the back cover of this handsomely packaged hardcover. Lucy the Octopus is set in the octopi-inhabited town of Stoneydip and tells the story of the titular cephalopod who, despite being the most unpopular girl in school and constantly bullied by everyone from her classmates to her indifferent family, retains her sense of kindness and thoughtfulness. While her everyday life is a routine of rejection she does have the dual consolations of her loyal pet Puffy (a poisonous pufferfish) and her membership of rock group Lamington Fuzz, even if she has to play guitar for them as the mysterious “Melon Mask” so that her true identity remains obscured. Chandler presents these stories in a newspaper-strip style with each landscape entry usually consisting of a small number of panels leading up to a humorous punchline. While on a first glance there may seem something incongruous about the mix of Chandler’s chirpy cartooning and the darker subject matter, in reality the visual innocence of the world he depicts serves to complement the book’s themes. Contrasting the cute and the unkind, it perfectly underlines the insidiousness of cruelty as social ritual, a theme that permeates the pages of this volume. And despite that appealing and colourful environment Lucy inhabits, Chandler is uncompromising in tackling the starker realities of her situation, from her bleakest thoughts to parental neglect. It’s a very fine balancing act but the book retains an air of hopefulness despite Lucy’s plight. In many ways Lucy the Octopus also reads like a love letter to the craft of the newspaper strip. Chandler is endlessly inventive with its format, finding ever new ways to play with the seeming confines of its structure. Meta diversions, clever lettering tricks, panel subversion, playful use of colour to reflect environment and occasional forays into homage (a Little Nemo in Slumberland digression is particularly fun as is Lucy as retro video game) all play their individual parts. Humour and poignancy walk hand-in-hand throughout as the reader continues to root for this long-suffering yet never defeated protagonist. Reading the whole saga in one sitting is a reminder that for all its apparent surface whimsy Lucy the Octopus is actually a very sophisticated work with a connective power that hinges on the notion of shared experience. Its almost morbid wit serves to re-enforce the very recognisable events of Lucy’s life; feelings of personal isolation and peer pressure that are as familiar in adult life as they are in childhood. With a denouement that feels both triumphant and yet certainly not saccharine, Chandler gives us a fitting finale to Lucy’s story… for now. A much deserved collection for one of the true mainstay comics features of the UK small press scene over the last several years.